A lot at 16th Avenue and Wolff Street has been cleared for more townhomes. Photo by Burl Rolett. A Denver homebuilder is adding 10 more townhomes to the Sloan’s Lake area over the next year. 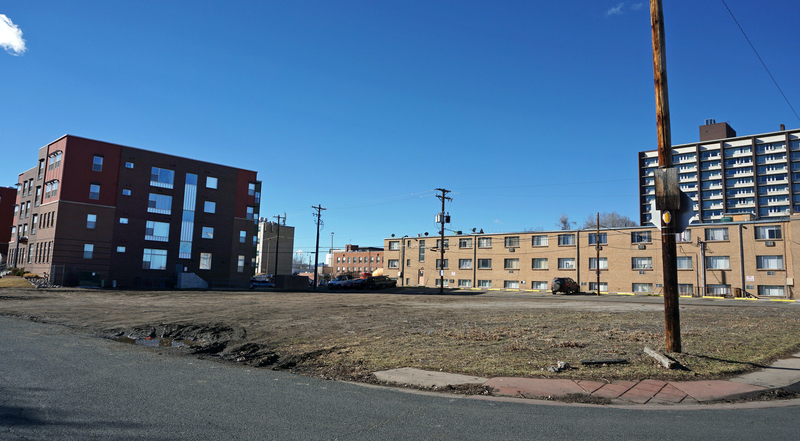 Alpert Cos. is planning a new 10-townhome development at 16th Avenue and Wolff Street, sandwiched between Colfax Avenue and Sloan’s Lake Park. The site is just two blocks away from a duplex and triplex project the firm built two years ago, and Vice President Brian Alpert said the location near Sloan’s Lake and the fast-growing LoHi neighborhood are the development’s biggest selling points. The site Alpert Cos. plans to build on stretches about half an acre southwest form 16th and Wolff. The land is cleared, and Alpert said the company plans to break ground this year as soon as its blueprints pass through the city’s review process. After construction begins, he estimated, it will take six to eight months to finish. The three- and four-bedroom townhomes will run between 1,600 and 2,800 square feet. Alpert said he doesn’t have a final construction budget, and prices could range anywhere from $400,000 to $700,000. Studio PBA is designing the project, and Alpert Co.’s in-house construction will likely be the general contractor. Alpert said the company has yet to determine how the project will be financed. The Alpert family has been building in Denver for about 60 years. Its portfolio includes primarily single-family homes, but Alpert said the company has built several multifamily projects as well. Recently, the company has nearly finished building out 66 lots at Valentia Court, a new single-family neighborhood just north of Parker Road near Lowry. With new projects and residents flooding into the LoHi area, Alpert couldn’t say what type of buyers would be interested in the new townhomes but said it could range from young adults buying a first home to seniors looking to downsize.